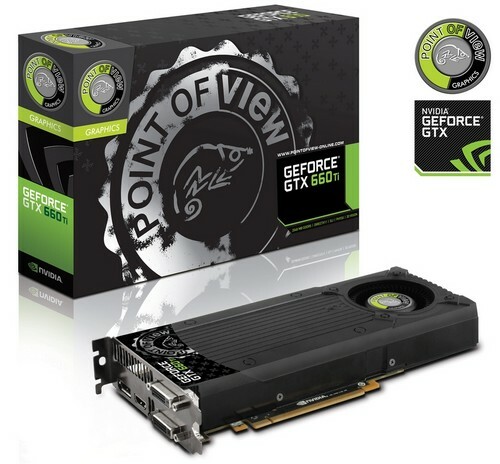 EINDHOVEN – August 16th 2012 – Point of View, a premier NVIDIA graphics partner and manufacturer of Android tablets, notebooks and other hardware, launches today the newest card of the GeForce® 600 family: the POV GeForce® GTX 660 Ti. The GeForce GTX 660 Ti breaks with the previous generation in terms of quality, performance and features! For all who have delayed their upgrade, this is the time! The GPU is built on the next generation streaming multiprocessor SMX technology which allows much faster calculations. The chip is produced on a 28 nm die-size – allowing high clock speeds and is twice as power efficient as its GeForce GTX 560 predecessor. 1344 CUDA cores to process all parallel calculations even faster! The card also has 2048 MB of DDR5 memory to keep up with all that GPU brute force! The GeForce® GTX 660 Ti is a DirectX 11 and shader model 5.0 supporting graphics card with of course existing NVIDIA features such as NVIDIA 3-way SLI® Technology, PhysX®, PureVideo® HD and CUDA™ being present! This design prides itself with an increased energy efficiency and better power management system. Thus a cooler and more stable card with higher clocks! The newest graphics card by Point of View will be available immediately, so contact your POV retailer for more information or visit the “Where to Buy” section of our website.